This paper focuses on the application of multi-criteria evaluation (MCE) technique for co-locating offshore wind farms and open-water mussel cultivation. An index of co-location sustainability (SI) was developed based on MCE, considering physical and biological parameters to be computed through remote-sensed data. The physical factors considered were wind velocity, water depth and sea surface temperature anomaly, while biological variables were chlorophyll a (as a proxy of the productivity) and Particle Organic Carbon (POC) concentration. The Danish portion of the Baltic Sea and the Danish North Sea represent the area used as testing site for the SI evaluation. In this area offshore wind farms are already installed and others are in construction or in the planning stage. The calculation of the index allows the classification of suitability conditions for the co-location of offshore wind farm and aquaculture, ranging from excellent to very poor, therefore enabling the selection of the most promising areas for their joint development. The results of the SI application can support more detailed studies in the selected areas, to be based on local data. Which variables should be considered to identify area suitable for offshore wind and mussel farms co-location? Can these variables be combined in a suitability index? How such an index can support maritime spatial planning? Offshore wind farms are widely spread in Denmark, however, their growth has proven to limit the allowable space for aquaculture sites. To enhance sustainability, improve marine space utilization and reduce costs, environmental authorities are encouraging to move the aquaculture facilities between the windfarms. The coexistence of this complementary use of marine space, is potentially possible in areas with limited depths (as in the Danish coastal waters) as well as in areas with higher depths where monopiles are substituted by semisubmersible structures. The paper describes the development and application of a co-location sustainability index (SI), based on multi-criteria evaluation (MCE). The index is finalised at identifying the most suitable areas to support the co-location of wind farms and open water mussels’ cultivation. The SI index is based on 5 variables: water depth, wind velocity, sea surface temperature anomaly, chlorophyll a concentration and POC concentration. Raw data of the five variables were spatially interpolated and normalised to obtain values between 0 and 1, using for each parameter a Parameter Specific Sustainability Functions (PSSF). In the case of wind speed, the maximum value of 1 (most favourable) was given to the mean wind speed associated with 100% of the power transfer function (12 m/s), while the other PSSF values were assigned consistently. For the water depth, a step cost function was considered, with four steps ranging from below 20 m (most favourable conditions) to higher than 40 m (least favourable conditions). Coastal interannual means of sea surface temperature were obtained from the monthly climatological mean data set. The climatological monthly mean data were compared with the corresponding monthly mean data to identify temperature anomalies and areas of persistently higher or lower temperatures than that of the coastal mean. Long-term chlorophyll a and POC interannual mean values were generated in an identical manner to that of SST, to identify regions with persistently low SST and high chlorophyll a, which correspond to areas of productive processes. The calculation of PSSF for the SSTa, chlorophyll a and POC was made on the basis of a normalization technique over the remote sensing data (values/max value). The final SI index was obtained by the combination of the five normalised variables; SI values were categorised in 4 distinct classes: good (SI≥ 0.75), medium (0.50 ≤ SI < 0.75), poor (0.25 ≤ SI < 0.50), unsuitable (SI ≤ 0.25). SI distribution in the studies area is reported in below Figure. 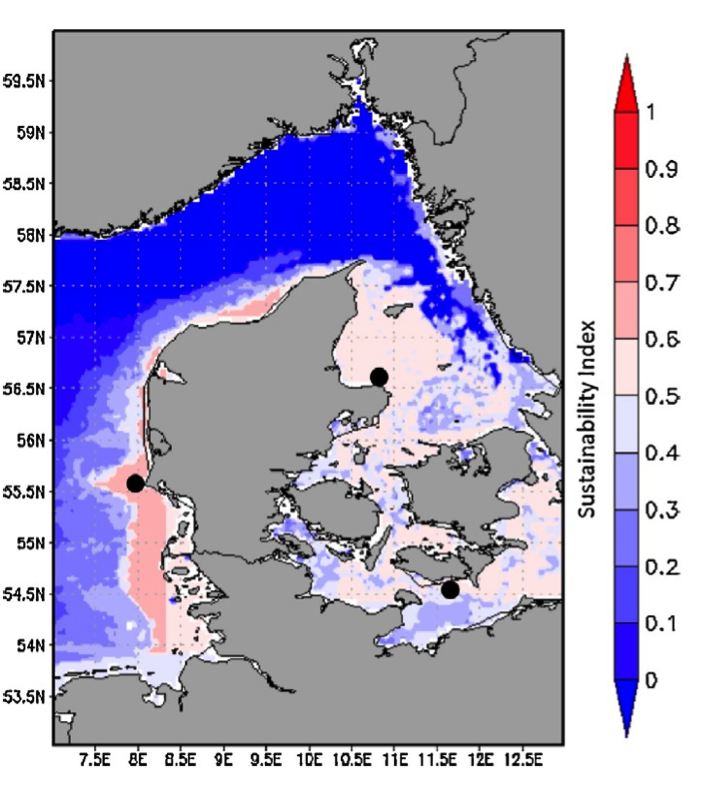 The SI values vary between 0 in the open ocean northern of the North Sea to 0.7 in areas closer to the coast. In detail, SI spatial distribution evidences higher values on the southern western and on the northern eastern coastal area of the Jutland and around the Zealand. The study highlighted that depth and wind speed are the factors largely controlling the SI distribution. However, integration of physical and biological parameters is considered crucial for assessing the suitability conditions for co-location of the two activities. Foteinis and Tsoutsos, 2017. Strategies to improve sustainability and offset the initial high capital expenditure of wave energy converters (WECs). Renew.Sustain. Energy Rev. 70, 775–785. This SI has a general formulation and can be applied to other areas. It can be useful to identify at a large scale areas which are suitable for the collocation of offshore wind farm and mussel aquaculture. The use of PSSF functions might require customization to the specific conditions of the considered areas, while availability of reliable remote sensed data is a relevant issue.